I've been intrigued lately by the Danish, or more widely Scandinavian, concept of hygge - pronounced hoo-ga or hue-gah! It's the way the Danes embrace the winter season as one of comfort, coziness, hospitality and togetherness when the weather is frigid and there is very little light. Find out more about Hygge here. In light of that idea, I wanted a clean and simple design evoking a Scandinavian look! Think IKEA! I was also part of a local challenge where the colour palette was Red, White and Grey (or Silver)! I was completely charmed by the challenge banner (above) and gave it a try. The little figures also reminded me of Danish design. We have friends who came to Canada over thirty years ago from Denmark and still keep their Danish traditions alive. 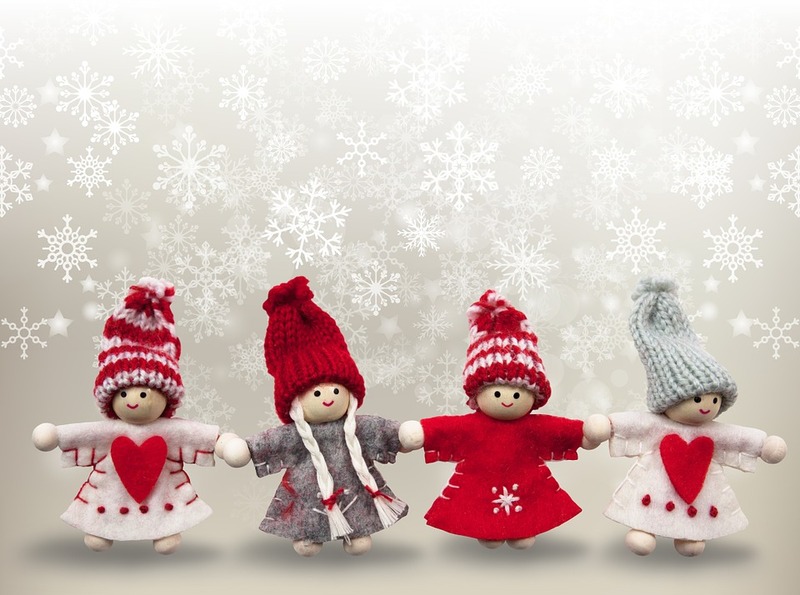 Some of their Christmas decorations included the "nisse", Christmas gnomes, which look a little like the picture above. So I am dedicating my card today to the Gravesens! The sentiment is actually from the November Paper Pumpkin kit, but was just the right size to fit within the circles. The card is actually one layer Smoky Slate except for the embellishments. Speaking of circles, I had no stamps the right size, so I used a pint mason jar and ring lid. I inked them up with Versamark and used a Stampin' Pierce Mat to provide a little 'give' when I stamped them, then covered them with Silver Stampin' Emboss Powder and heat set it with the Heat Tool. Necessity is the mother of invention, yes? Gorgeous Grunge provided the spatter stamp for the center which I stamped in Cherry Cobbler and Craft Whisper White ink. The Pretty Pines thinlits gave me the Whisper White fir boughs and the Cherry Cobbler berry sprigs. I added some Silver Foil Sheets punched with a Martha Stewart leaf punch I've had forever. I used both sides of the foil giving me the silver and also white. 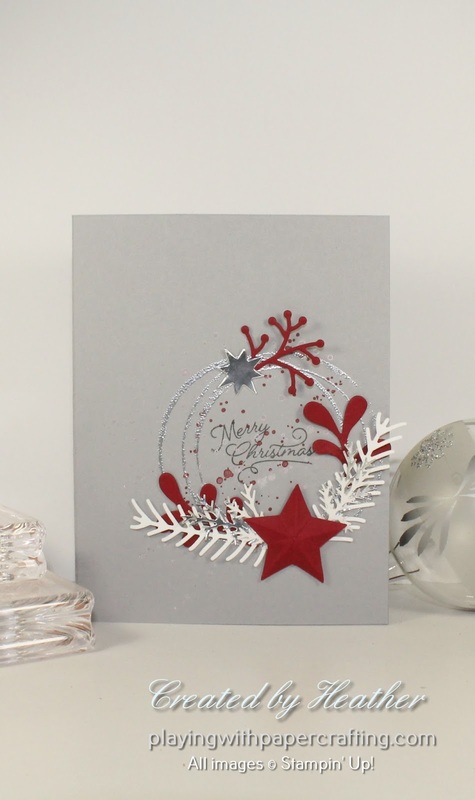 The starburst at the top of the circle is die cut with the Starlight Thinlits dies from Silver Foil again and the Cherry Cobble star was punched with the Medium Star Punch, scored 5 times and folded for the 3D effect. 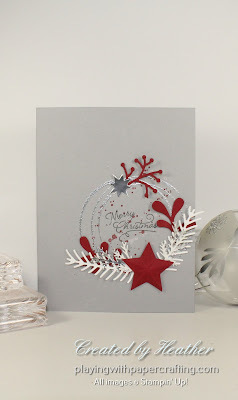 Most of the embellishments were added with Glue Dots, except for the star which was added with a double Stampin' Dimensional. So, as we would say to our friends, the Gravesens, as we watch them light the real candles on their Christmas tree, "Glaedelig Jul!"